PDF Reader — iPhone Edition, developed byKdan Mobile Software, has been recently updated to be even better than before. I’ve become a big fan of KDan’s whole iPhone app catalogue over the past year: every app of their’s that I’ve taken for a test-drive has impressed me with thoughtful design and high performance. 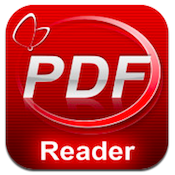 When we last took a look at PDF Reader — iPhone Edition from KDan, we gave it a score of 9.5/10. In particular, I liked the scanning feature, the ability to backup and transfer files, and a great freehand feature you can use to sign documents on the go. Featured as one of best apps in the Utility Category of App Store Rewind 2011, and placed on the list of Top 100 apps in over 90 countries since being released (6 million downloads to date), KDan’s PDF Reader — iPhone Edition has been given tons of acclaim since its initial release. The most current version (Version 3.9.1) had made an already great app truly outstanding. The PDF viewer has been souped up, resulting in faster and smoother rendering performance, enhanced hyperlinks, and better support for annotations when you scroll through multiple pages. There are more markup options as well, including 18 stamps for your documents. There are also more options for cloud storage: Google Drive and Mydisk.se (WebDAV server) are now supported. Additionally, the latest update supports new file formats using the Open-in feature–RAR, BMP, and JPG. KDan deserves their reputation for outstanding iPhone business apps, and should be applauded for continually working to improve the apps in their library. KDan’s PDF Reader — iPhone Edition is a supremely useful app that’s well worth the price. PDF Reader — iPhone Editionis compatible with iPhone, iPod touch, and iPad. Requires iOS 3.0 or later.A small expedite fee was paid by the developer to speed up the publication of this iPhone app review. Like KDan mobile offerings? Check out some of their other products:PDF Connoisseur,Pocket Snapper, and Noteledge.